Some of the best ideas are made on the fly, and this recipe was one of those. While perusing my local fruits and veggie market I decided it had been far too long since I had made acorn squash – a childhood favorite. 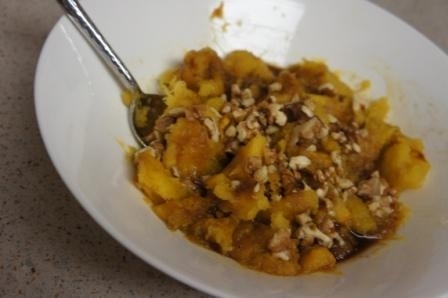 ple syrup and then let us eat up the the sweet squash with a spoon. But I wanted to try a slightly new spin, and instead of roasting it with maple syrup, I opted to roast it and then finish it with pomegranate molasses and for crunch, some chopped walnuts. You can find pomegranate molasses in many supermarkets, but if not you can also order it online. Don’t want to buy it? The Shiksa has instructions how to make your own pomegranate molasses! Mix brown sugar, salt, pepper and crushed red pepper. Sprinkle over each half of squash. Roast squash for 45-60 minutes or until tender. Scoop out flesh and mash with a fork until desired consistency. If you prefer very smooth, put through a food processor. An auspicious food for Rosh Hashanah.